I am sure most people have heard or seen Dr Dawn Harper at some point. This could be on Channel 4's Embarrassing Bodies, or ITV's This Morning where she is a resident doctor well now she has a host of books including two that looks at your baby's first year and toddler health. "All you need to know from the first nappy to the first step"
I am sure I am not the only first time mum who went out and bought a few baby books which were never really looked at. I bought one that was huge but I barely looked at it. It had too much stuff crammed in the book that it just wasn't of interest or took too long to find something that was helpful. 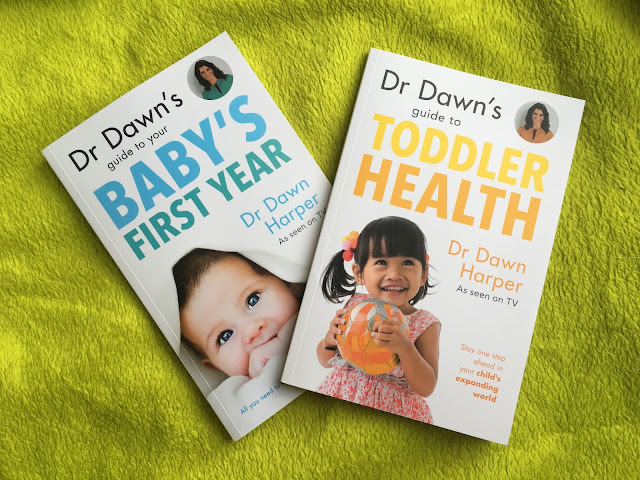 Dr Dawn's Guide to Your Baby's First Year - Dr Dawn Harper -is much, much shorter at 73 pages but has already proved to be more informative. It starts with a little introduction about Dr Dawn's experience of becoming a mum for the first time and how to take care of yourself as a new mother. It then looks at things like breastfeeding with helpful hints and tips to help make it an easier journey than it might be. Bottle feeding and a little about weaning. Other sections include sleeping, teething, travelling with a baby, developmental checks and milestones, as well as infant ailments, medicines, vaccinations and first aid and general safety around the home. The information contained in succinct and to the point and covers a wide range of topics. Especially helpful if the A-Z of common ailments and the first aid section which, thankfully I have not had to use, but could come in incredibly useful in the future. I do wish there had been more information in the development milestones section if I am honest as that is something I am always worrying about. Dr Dawn's Guide to Toddler Health - Dr Dawn Harper - covers from 12 months to 5 years and looks at common milestones and when they are likely to be met. Other topics include bathing and hygeine , teething, travelling with your toddler, vaccinations and like the first book has a handy A to Z of toddler ailments, medicines needed and toddler safety. Much like the first book the first aid section is a great addition to the book as you never knew when you might need to use the knowledge gained through this book. The book doesn't go into great detail about each topic which can be a good thing if you only want a bit of reassurance or information. Too often you can be swamped with information that you become overwhelmed by it all. Both books are written in plain, straightforward terminology making it easy to understand without needing a medical degree. You do not feel patronised whilst reading these are they are written in a friendly manner. I wish I had the Baby books to help with breastfeeding 10 months ago! They are books you will dip in and out of a lot but that can be read in one quick sitting and would be useful on any parent's bookcase. I was sent a copy of Dr Dawn’s Toddler Health Guide and Dr Dawn's Guide to Your Baby's First Year to review. All views and opinions are mine and mine alone.